My new Etsy shop is now open for business! I am still in the process of listing the 70+ stamp designs that I have created, but there are many up right now for purchase. (All stamp design listings will be up by Monday.) 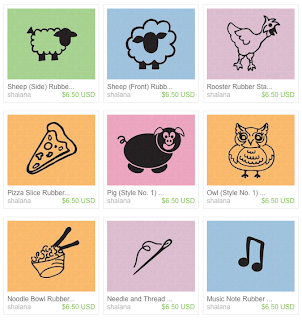 I have several animal and nature stamps to choose from as well as many fiber art related designs and label/tag designs. All stamps are the same price no matter what shape or size. I will also be making listing for the option to pick your own set of 5 or 10 and receive a discount for buying in bulk. Please spread the word about my brand new Etsy shop! I hope that you like what you see so far. A lot of hard work has gone into the creation of each stamp as well as my shop setup, but it has been fun so far and very worth it. Oh, and don't worry, my funky felter Etsy shop is still there and going strong!